Eccentric by name, eccentric by nature - this little chap is a tad unusual as far as Leather Club Chairs go but that's why we love him so much. He's got a quirky top which we like to call his collar and shoulders, his arms have flat tops with curved fascias and he's got a few unexpected angles here and there. He's super comfy though thanks to his extra padding and his gorgeous seat cushion. But what will really stick in your mind though, is his studs. There's hundreds - as I said, unusual - now that's Eccentric. 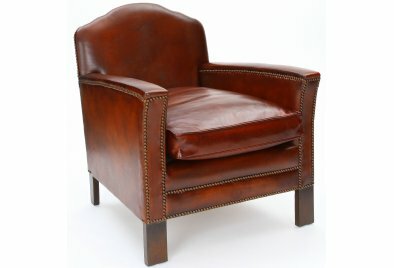 To meet other wonderful Leather Club Chairs like Eccentric, please click here!